Here in London, the British summer is in full swing, i.e. it hasn’t stopped raining for the past two months. Or is it the past two years? Can’t quite remember. After almost a decade in this country, I can now say with confidence that rain has been a staple of my British residency. 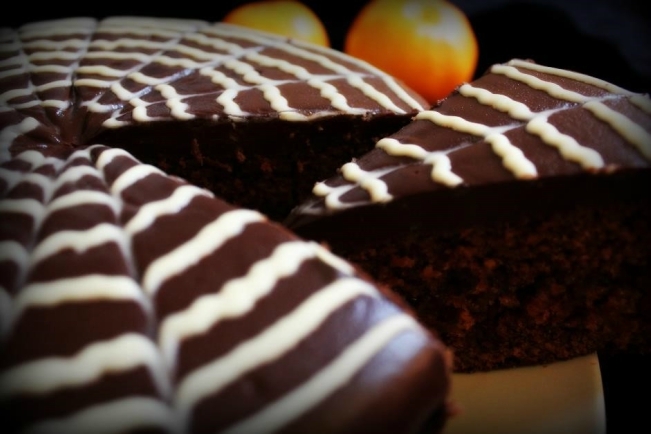 To stay true to the British summer, I’ve come up with this Pimm’s Hollywood-inspired cake. To me, nothing shouts the months of June through to September better than a large glass of Pimm’s mixed with lemonade and all its accompaniments (mint, cucumber, orange and strawberries) and, of course, wearing a turtle neck (well, it’s cold, isn’t it?). 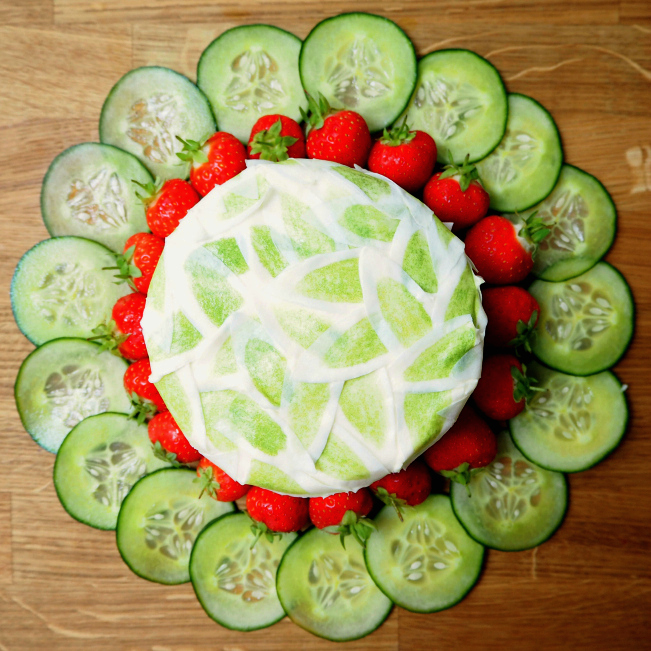 You might be baffled by the Mandala-like picture above, although it gives you in a hint as to what is in the cake. But, actually, cucumber in a cake tastes no weirder than carrot in a cake. The flavour is very subtle and the freshness from the cucumber comes through. It also makes the cake very moist. I have also managed to include all the other trimmings (check the recipe below). 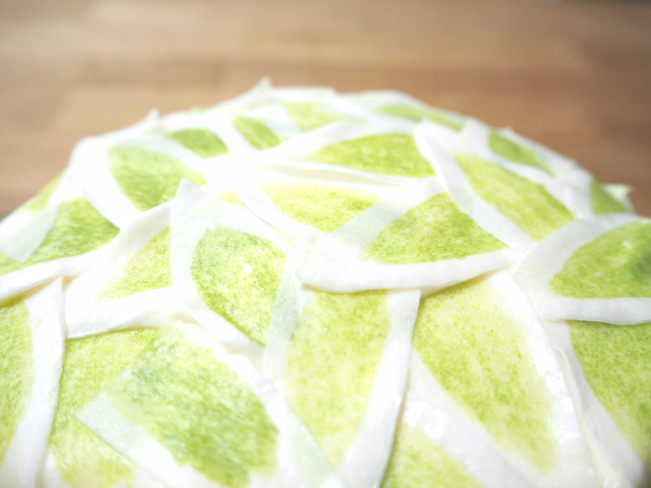 As for the lemonade, I tried to mimic its flavour with white chocolate and lemon zest in the icing. I must say, it worked out quite well. By now you may be wondering about the reference to ‘Hollywood’ in the title. Unless you’re a ‘Singin’ in the Rain’ fan like me, I can’t really hold this against you (although I do fail to understand why not everybody is addicted to this Classic Hollywood film ;-)). Singin’ in the Rain is simply enchanting and its aesthetics never fail to amaze me. It is set in the late 1920s and this cake is an homage to one of the amazing dresses that Debbie Reynolds wears in the film. Now that you’ve got the full picture, you’re ready to bake! 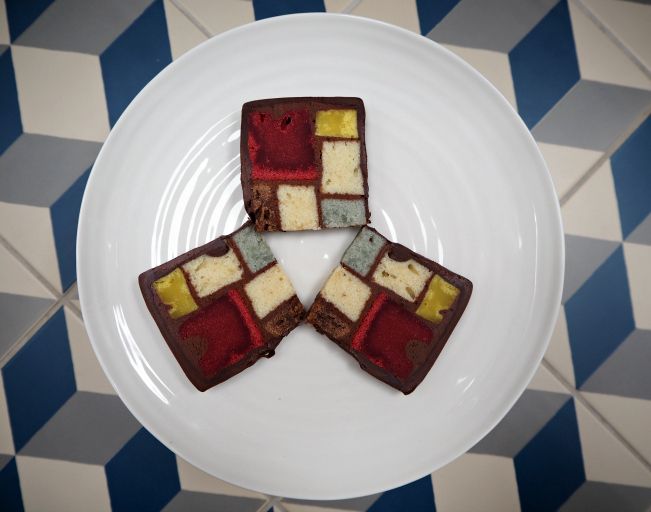 It’s now time for another Mondrian-themed project. 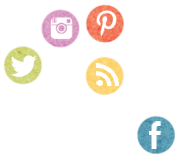 And, for once, I’m talking biggish DIY, i.e. 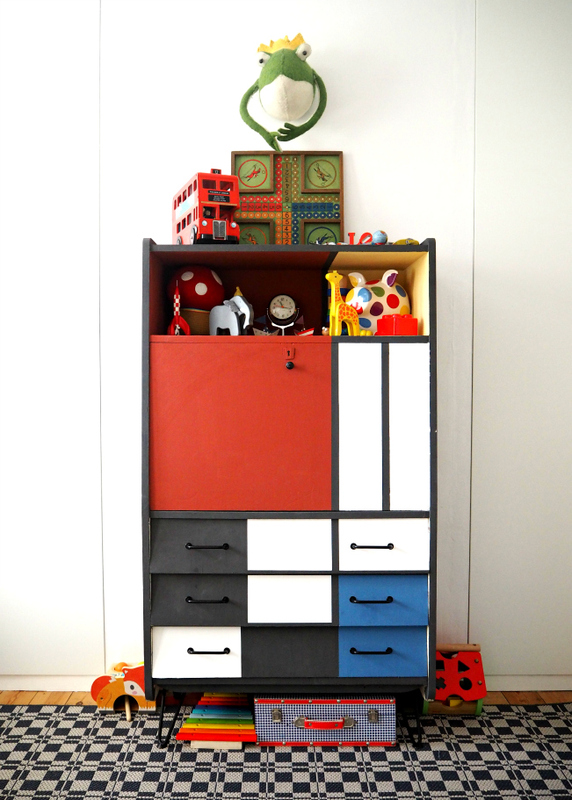 furniture up-cycling, with this Mondrian inspired chest of drawers. When she was a child, my mum used to have a desk/chest of drawers which, I believe, was plain wood. When she was pregnant with me, she painted it with a lovely seaside scene and a rainbow. I used it for a few years until it made its way to the cellar, probably in the early 90s. About a quarter of a century and several cellar-flooding events later, I decided to bring the furniture back from Paris to London to try and give it a new lease of life (although given it’s at the mercy of my children, I’m not quite sure how long it will last). We (my partner and I) were faced with a colossal task, to say the least. The wooden feet and the backboard were rotten, two of the drawers were broken and the paintwork had seen better days, as you can imagine. There was no way I could salvage my mum’s art so I decided to go for something completely different. Today, I’m trying something new. I’ll be sharing this DIY both here and on Instagram so I’ll keep it short and sweet, just like me ;-). Any questions? Don’t hesitate to ask in the comments below. 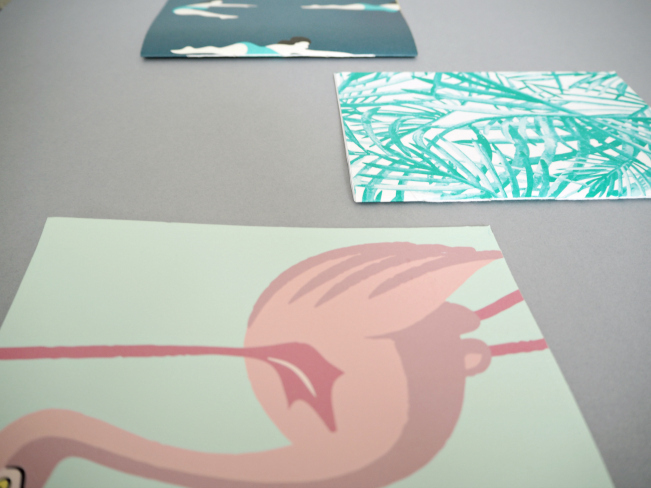 To make a Hollywood notebook, I used beautiful wallpaper samples from Papermint. They’re gorgeous, especially the one with the swimming ladies. It reminded me of Esther Williams, the ‘aquamusical’ muse. I’ve always loved the aesthetics of these films, slightly kitsch yet so elegant and colourful. Below is the notebook DIY in a few easy steps! I’m back with an exciting project. 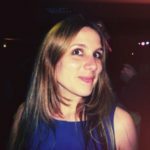 I was recently reading an article about the upcoming opening of two museums dedicated to French designer Yves Saint Laurent in Paris and Marrakesh. Apparently, six iconic Mondrian dresses had to be made again because very few original ones still exist. I’ll spend a bit more time talking about Piet Mondrian in my moodboard post. But thinking about that dress brought back memories of a Mondrian cake, also based on one of the Dutch artist’ paintings, I’d seen on the Internet ages ago. 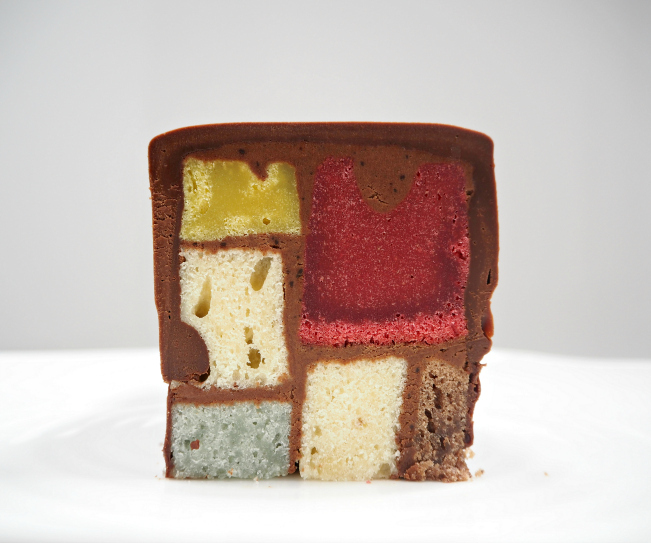 On paper, that Mondrian cake looked like…well, a piece of cake. It seemed like all I needed to do was cut bits of coloured sponge cake to the right size before sticking them together with chocolate icing. To conclude my Paris memories theme, I’ve come up with this little cardboard Paris DIY that has also enabled me to recycle some old cardboard boxes – one stone, two birds 8-). I was left with, at least, a dozen of these following the recent work we undertook in our flat. I was looking at them, fuming at the fact that I would be throwing away perfectly good boxes when I had this light-bulb moment. As a kid, I would spend hours building things out of lego, paper or cardboard for my teddies and little figurines. I’ve always thought that this was funnier than actually playing with my toys. 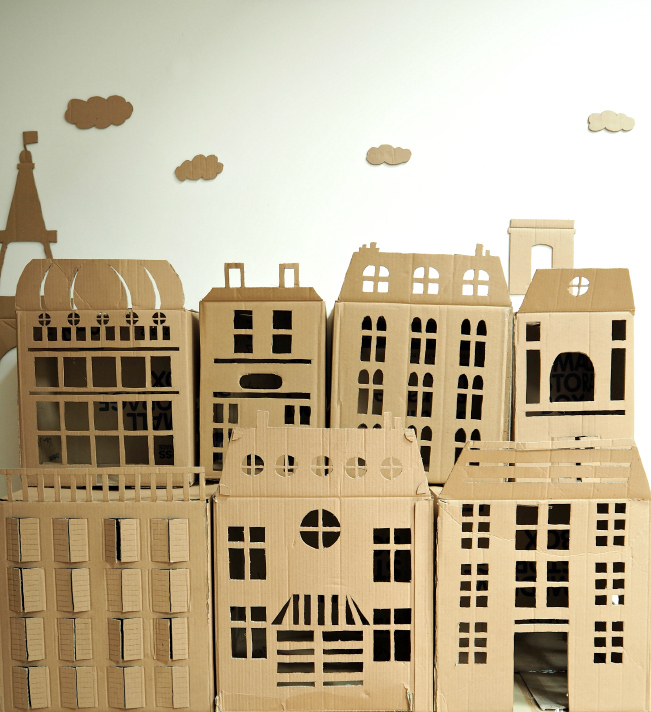 They years may have passed but I still found out as enjoyable as ever to build these Haussmann-inspired buildings with nothing more than cardboard, a scalpel and some sellotape. I also had quite a bit of fun doing the gif above. A little homage to the Chanel advert from the eighties, remember?